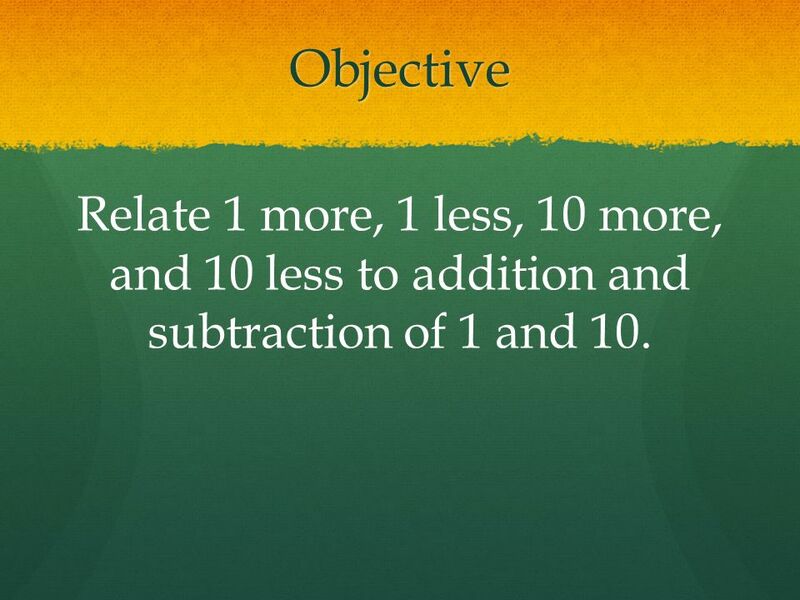 2 Objective Relate 1 more, 1 less, 10 more, and 10 less to addition and subtraction of 1 and 10. 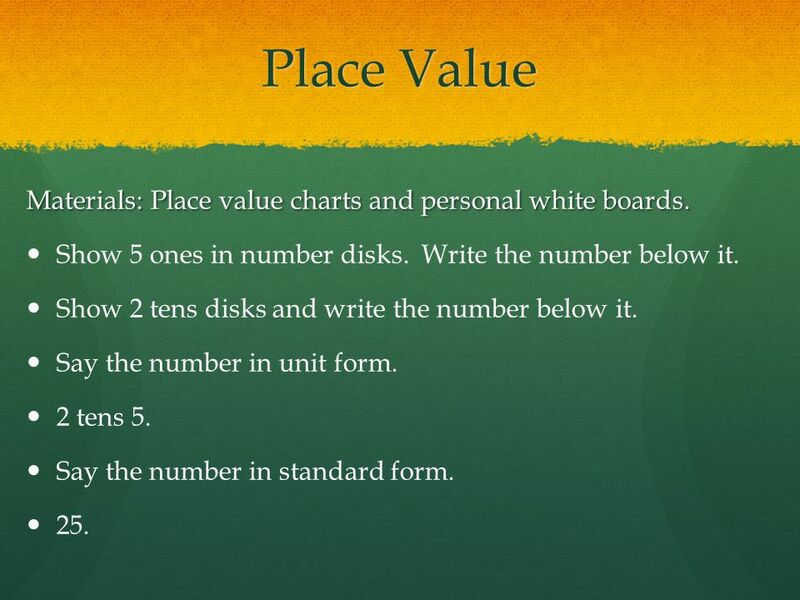 3 Place Value Materials: Place value charts and personal white boards. Show 5 ones in number disks. Write the number below it. Show 2 tens disks and write the number below it. Say the number in unit form. 2 tens 5. Say the number in standard form. 25. 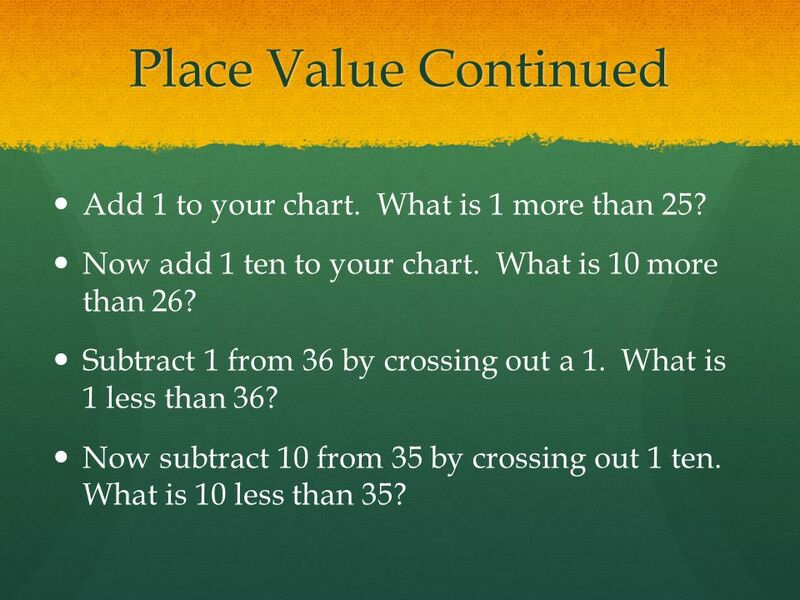 4 Place Value Continued Add 1 to your chart. 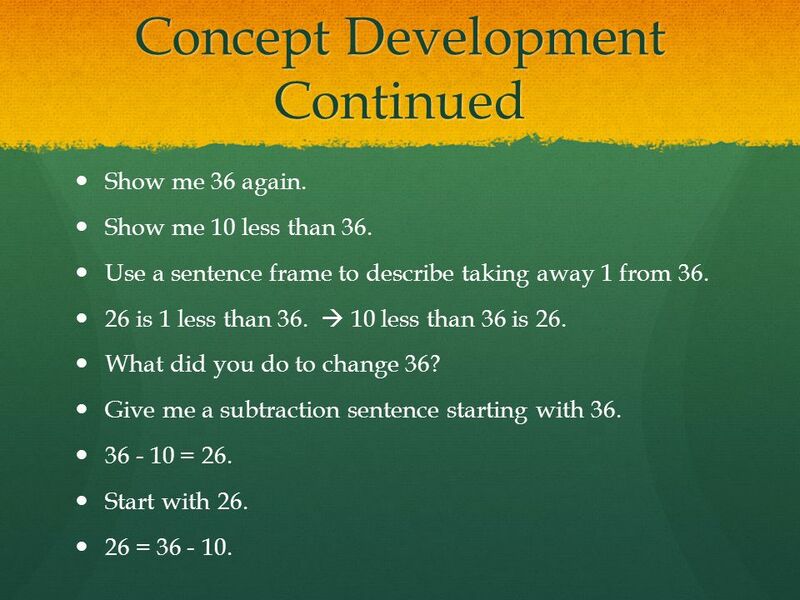 What is 1 more than 25? Now add 1 ten to your chart. What is 10 more than 26? Subtract 1 from 36 by crossing out a 1. 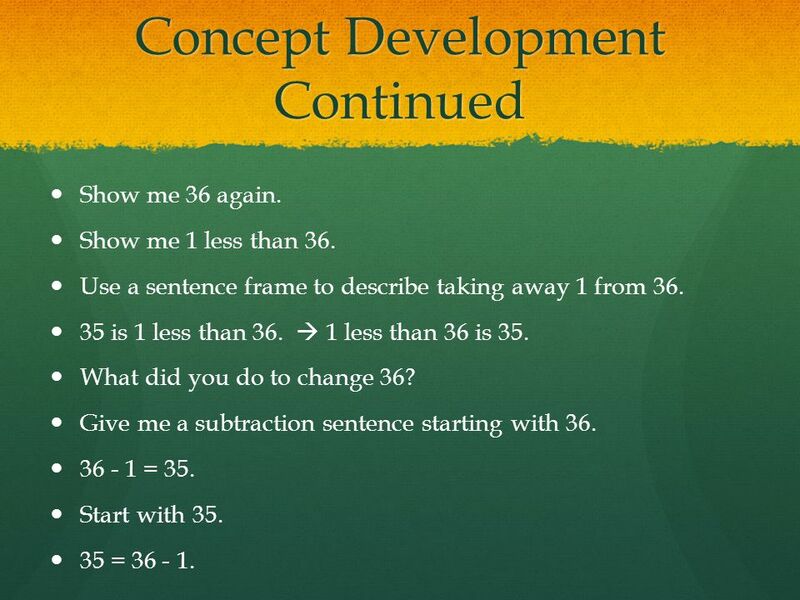 What is 1 less than 36? Now subtract 10 from 35 by crossing out 1 ten. 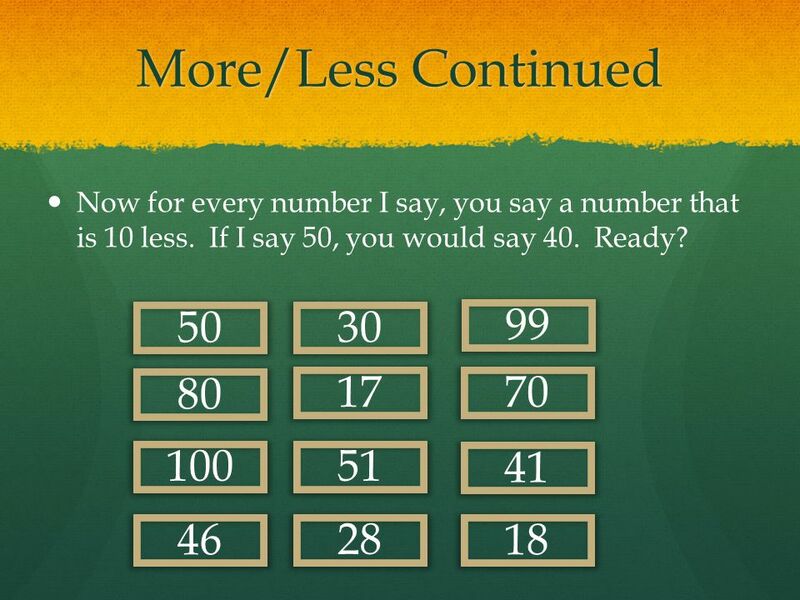 What is 10 less than 35? 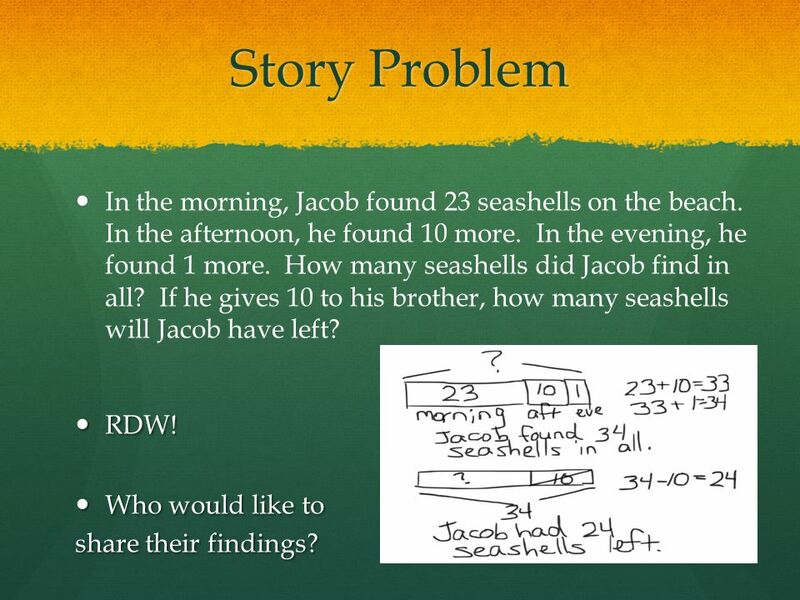 9 Story Problem In the morning, Jacob found 23 seashells on the beach. In the afternoon, he found 10 more. In the evening, he found 1 more. How many seashells did Jacob find in all? If he gives 10 to his brother, how many seashells will Jacob have left? RDW! Who would like to share their findings? Talk with your partner. 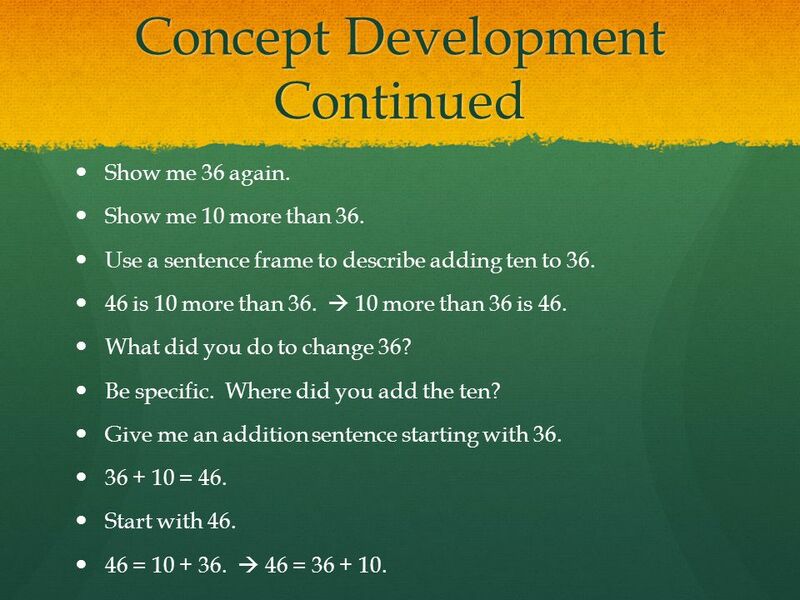 Use place value language to explain what you understand about 1 more, 1 less, 10 more, and 10 less. 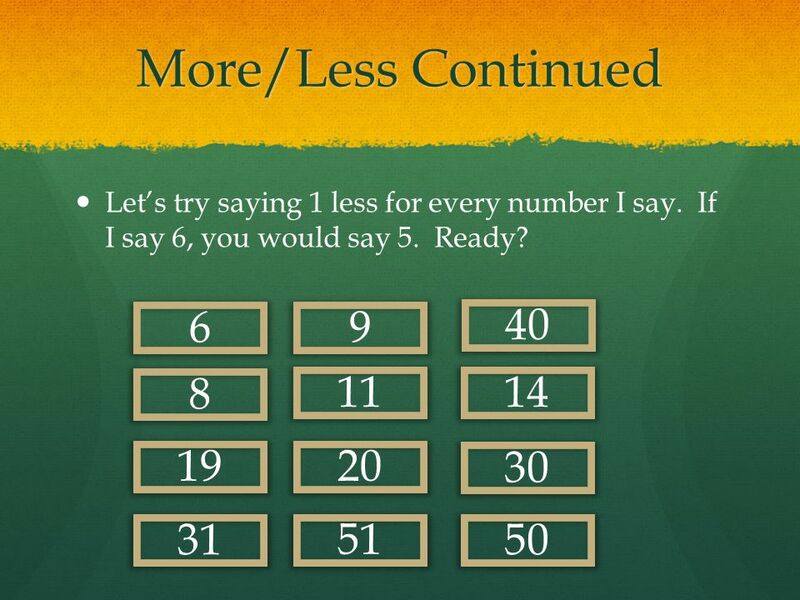 Listen as I say a number pattern. Raise your hand when you know the more or less rule for my pattern. If I say, “45, 46, 47, 48, 49,” you say, “1 more.” Wait for my signal. Ready? 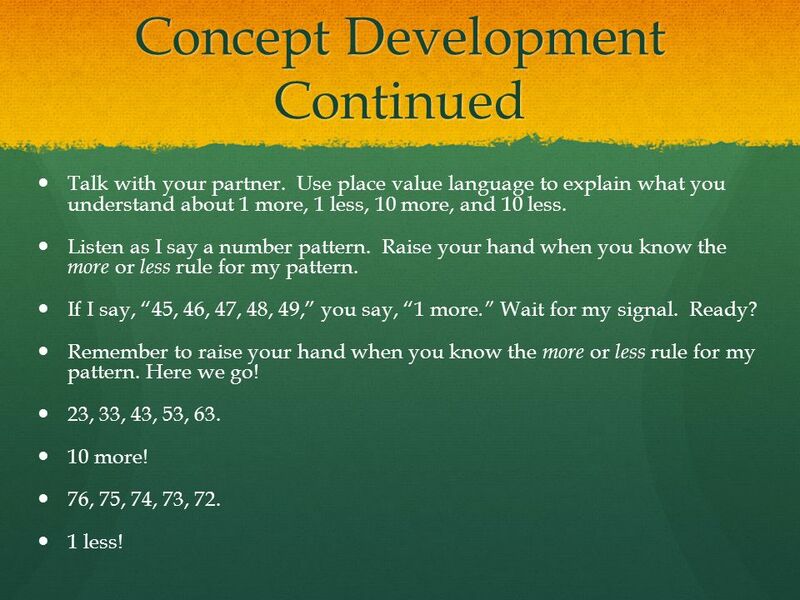 Remember to raise your hand when you know the more or less rule for my pattern. Here we go! 23, 33, 43, 53, 63. 10 more! 76, 75, 74, 73, 72. 1 less! Take out your white boards. Now I’ll write a series of numbers on the board. 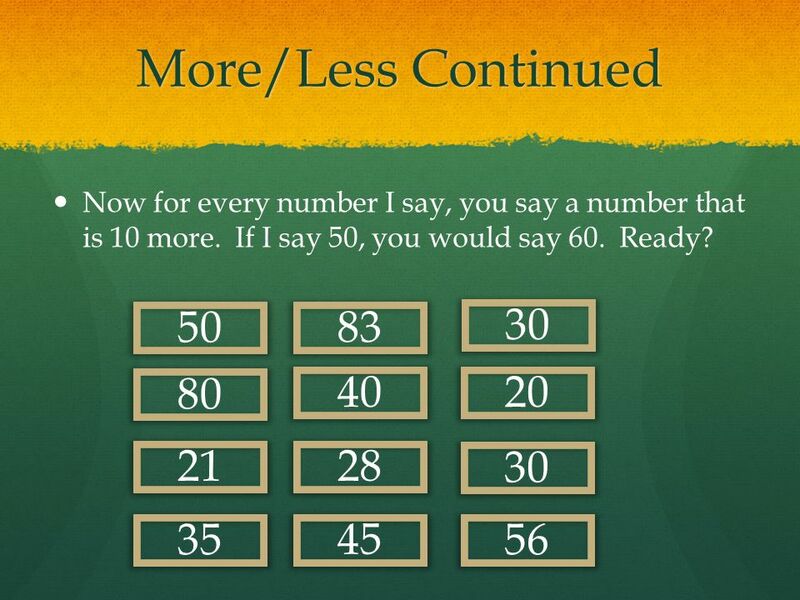 You will write the rule and the next three numbers. Turn your board over when you have written your answer. Wait until I say, “Show me.” Ready? Show me. 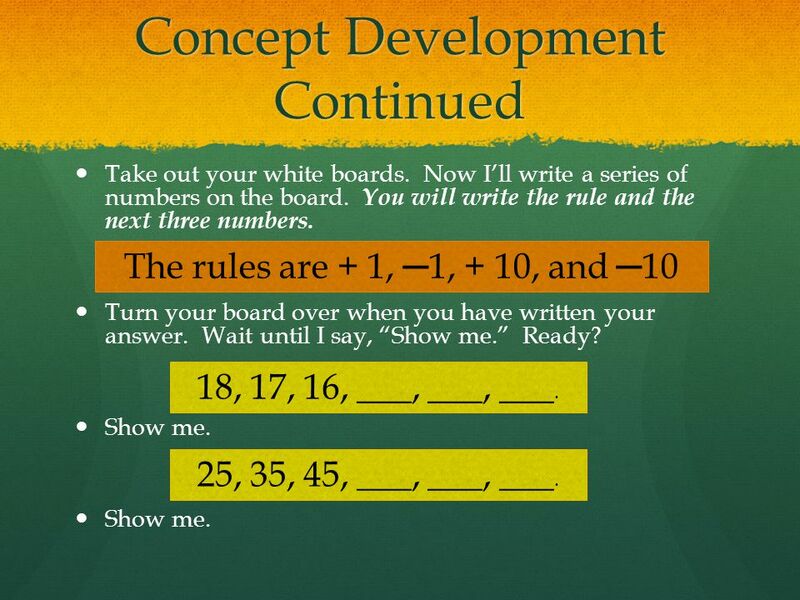 The rules are + 1, ─1, + 10, and ─10 18, 17, 16, ___, ___, ___. 25, 35, 45, ___, ___, ___. 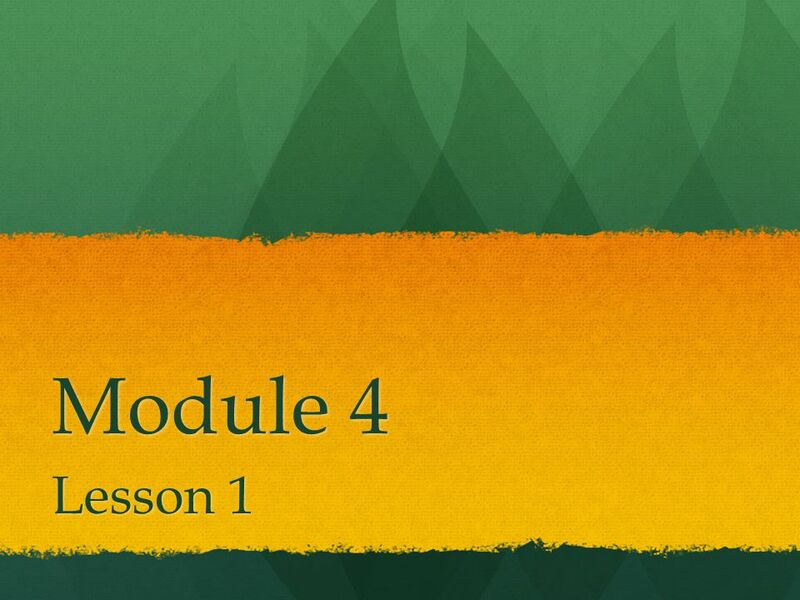 Download ppt "Module 4 Lesson 1." Module 5 Lesson 2. 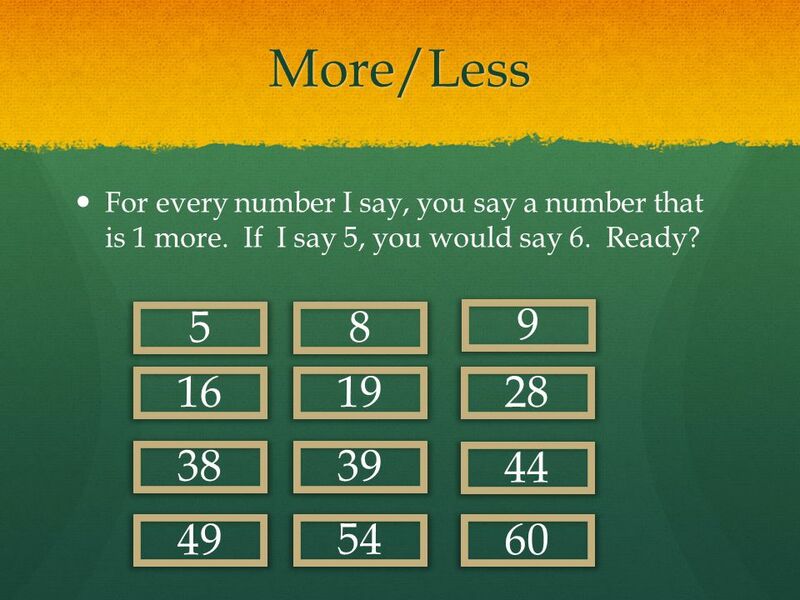 Objective Add and subtract multiples of 100 including counting on to subtract. MODULE 3 Lesson 16. 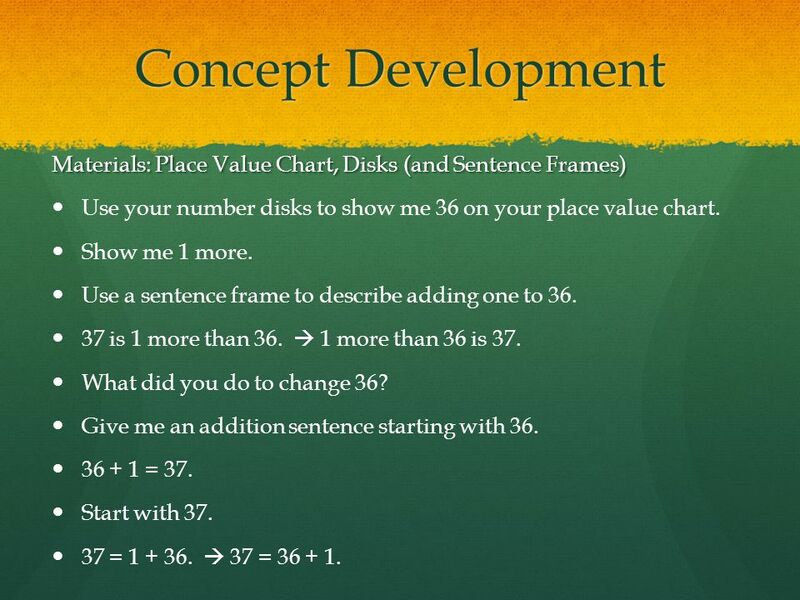 Objective Compare two three-digit numbers using, and =. Module 6 Lesson 6. Objective Decompose arrays into rows and columns, and relate to repeated addition. More and Less Lesson 5.1:. Number Bonds of Ten Lesson 1.1. Module 5 Lesson 11. 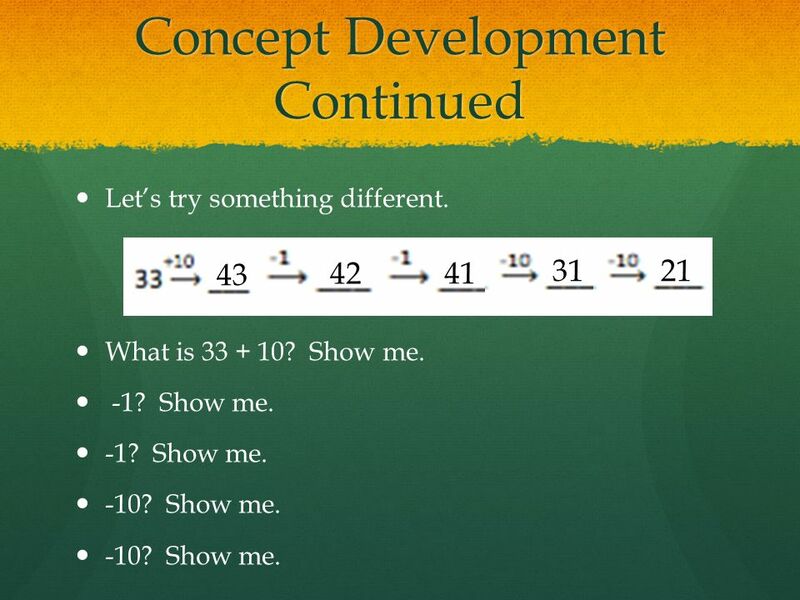 Objective  Use math drawings to represent additions with up to two compositions and relate drawings to the addition algorithm.